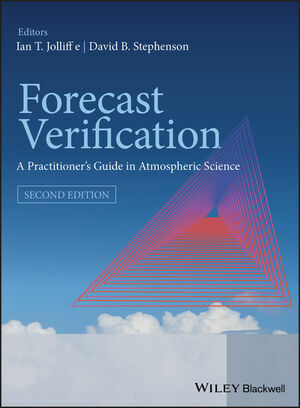 Forecast Verification: A Practioner's Guide in Atmospheric Science, 2nd Edition provides an indispensible guide to this area of active research by combining depth of information with a range of topics to appeal both to professional practitioners and researchers and postgraduates. The editors have succeeded in presenting chapters by a variety of the leading experts in the field while still retaining a cohesive and highly accessible style. The book balances explanations of concepts with clear and useful discussion of the main application areas. Cover image credit: The triangle of barplots shows a novel use of colour for visualizing probability forecasts of ternary categories – see Fig 6b of Jupp et al. 2011, On the visualisation, verification and recalibration of ternary probabilistic forecasts, Phil. Trans. Roy. Soc. (in press). Professor Ian Jolliffe is currently a Honorary Visiting Professor in SECaM. He took early retirement in 2004 form the University of Aberdeen, where he is Professor Emeritus and where he spent 12 years as Professor of Statistics before his retirement. Before Aberdeen, he was Lecturer, then Senior Lecturer in Statistics at the University of Kent for 22 years, apart from two one-year visiting posts at the Dalhousie University and the University of Guelph. He gained his PhD in Statistics in 1970, and has been an active teacher and researcher in Applied Statistics since then. His thesis was on variable selection in principal component analysis (PCA), and topics related to PCA have formed a substantial strand of his research throughout his career. He has a long-standing interest in applications of Statistics to atmospheric science, and forecast verification is now one of his main research interests. He has co-authored two other books and has over 85 other publications; roughly one third of these are directly related to applications in climate or weather. He has successfully supervised 20 research students, 16 of them at PhD level.